While projects like Black Mesa are intent on bringing old games into the new era, getting them to take advantage of all the shiny additions to computers that have come with time, it’s not often that we see new games being shoved into ancient hardware. 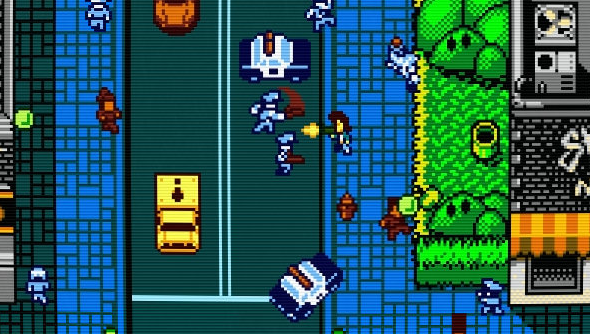 Though that’s what VBlank Entertainment have done with the recent release Retro City Rampage. Check out the making of ROM City Rampage below. “The background can use up to 13 colours at once”. So more than Dead Space, amiright? Okay, I’m not good at pithy remarks. Nonetheless, even though we won’t be running out any time soonto crack an NES and hook it up to run a less feature rich version of a modern game, its a fascinating project. Now if we can some other modern day releases running on the consoles of old. An 8-bit Dishonored, say, or The Walking Dead as a text-based adventure. Hmm, that’d be remarkably similar, if maybe a little less traumatising.